You can center text using a button in your text module. This is best for if you want to center a small amount of text, as an occasional formatting choice. 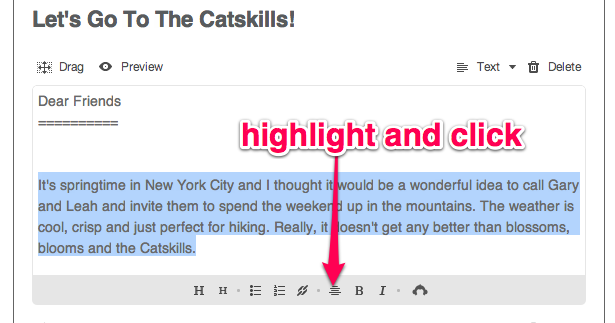 If you want your text centered all the time, make that change to your text type in the style editor. Highlight the text that you want to center. Click (Center text), at the bottom of the text module. You will see -> and <- on either side of your text. This means that text will show as centered, when you preview. Click Preview at the top of the text module. When the rest of your campaign is ready, send it off to your subscribers!